Here we are on the heels of another year. Can you believe it?! I hope the year has been good to you. I wanted to share one quick cocktail recipe with you before I say goodbye to 2013. There will be no champagne or booze for me this New Year’s Eve, but that doesn’t mean you can’t enjoy a cocktail or two. In fact, please have one for me. What are your NYE plans? We are getting together with friends that also have children which is nice, no worrying about hiring a babysitter and that whole rigamarole. Some year though I want to dress up all fancy (ie lots of sequins) and attend or host a real NYE bash. New Year’s day I am hosting the third annual New Year’s day brunch. It is going to be a small crowd since my oven is unreliable and my dishwasher isn’t working. 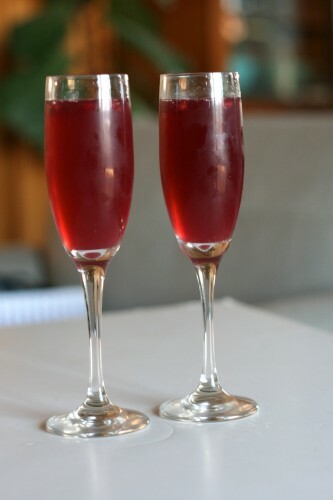 This cocktail would be perfect for your NYE party or a New Year’s day brunch. If you need to make it a mocktail like me I like to substitute a good ginger-ale for the alcohol, you could also use club soda. Happy New Year friends! See you in 2014! 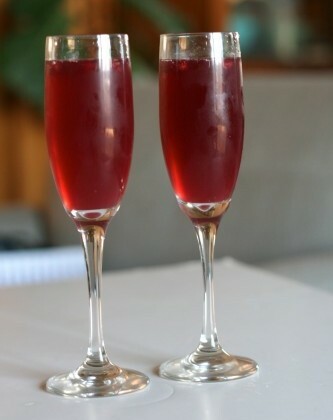 Mix together pomegranate juice and triple sec. Pour mix into champagne flutes, filling about half way. Top off with champagne. Garnish with pomegranate seeds. CHEERS! Cheers!! I love pomegranate and I can imagine this will be an instant hit!! NYE I am staying in with some friends and ringing in the New Year in a non-fancy get together lol!